Last week we hosted a reception at our home, but the guest of honor had a serious gluten allergy, so I chose a flourless chocolate cake as the dessert. I’ve made this type of cake several other times, but on this occasion I went with a new recipe whose name I couldn’t resist: Chocolate Intensity Cake. Nothing beats that! The cake bakes in a water bath to ensure its fudgy texture, and then it gets smothered in chocolate ganache, as a double dose of goodness. If you’re a cake-pro, go for a completely smooth icing and perhaps some decoration with ganache on top. I went with swirls, for reasons that I won’t discuss in public. Heat the oven to 350F. Grease the bottom and sides of a 9-inch springform cake pan. Place chopped chocolate in a large bow and set aside. Place the butter, sugar, and coffee in a medium saucepan and cook over medium high heat, stirring occasionally until the butter is melted and the mixture begins to boil. Pour the hot butter mixture over the chopped chocolate, let it sit undisturbed for one minute, then whisk until the chocolate is fully melted and smooth. In another bowl, whisk the eggs until completely blended. Add the vanilla extract and salt, mix again. Pour a small amount of the hot chocolate mixture into the eggs, whisk gently, and add all the egg mixture into the bowl with the hot chocolate. Pour the batter into the springform pan. Wrap the outside with three layers of aluminum foil, place it inside a large roasting pan and pour enough hot water to come halfway up the sides of the cake pan Bake cake in the water bath for 35 to 45 minutes, until the center is still a bit shiny but almost set Carefully transfer the cake pan to wire rack and let the cake cool for 20 minutes. Run a thin bladed paring knife around the edge of the pan to loosen the cake, open the springform, and place the cake over a plate still on the bottom of the pan. Refrigerate for at least 2 hours before adding the glaze. Make the glaze by adding the chopped chocolate in a bowl. Heat the cream almost to a boil in a small saucepan. Remove from the heat and pour over the chocolate. Stir until completely smooth, add the vanilla, and stir again. 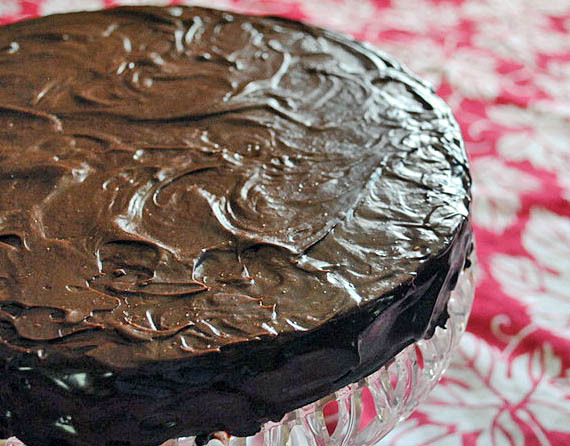 Let it sit for 5 minutes at room temperature, then slowly pour the glaze over the chocolate cake, starting from the center. Smooth the surface and sides with an offset spatula. Refrigerate the cake, and bring to room temperature for 1 hour before slicing it. To my relief, the compliments kept coming, two guests said it was THE BEST cake they had ever had, and they were using all caps for the statement. Two commented on the pleasant “smokiness,” wondering where that could be coming from, and indeed, it was the coffee singing in the background. Coffee and chocolate, hand in hand, a perfect match. I must say that this cake was awesome. 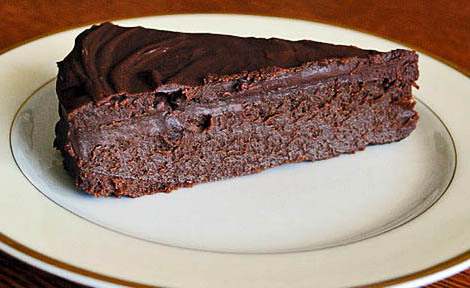 The ganache becomes a single entity with the cake, making a velvety, smooth texture. A tiny slice will be enough because it’s so rich, but the intense chocolate flavor will linger in your mind, and you may find yourself reaching for a second slice, just to make sure you weren’t dreaming! Decadent and delicious looking. No wonder the compliments kept coming.Compliments to the chef. I love cakes that use melted butter to start with, they are much more user friendly…. What a success!! That last photo says it all. You can just taste the velvety smoothness and I know exactly what you mean about the ganache becoming one with the cake 🙂 (gotta love these 7 am spiritual accounts of food). You took a risk on an untested recipe and pulled it off beautifully. Awesome Sally. The name is perfect too – I’m feeling the intensity! Nothing I like better than starting the day with some gastronomic Nirvana described in detail…. Chocolate and coffee do make a lovely match. This sounds decadent and delicious. And, your swirls on top look great! Sinfully rich. I’d be going for the swirls too. What swirls are just prettier! I am a swirl kind of lady…. It looks decadent Sally….I will try it this weekend. I do not like coffee, but realize the wonderful compliment it makes to chocolate. Decadence here I come! Looks amazing and I second the sentiment that cakes aren’t your nemesis afterall! Will have to get Nana onto this recipe very soon! I have printed this out for my husband! He is the resident baker here and is always asked to bring dessert. He also loves to fuss…………..